With whatever's left on my macbook's battery and internet.. there's this song that accompanied me this whole day: You are For Me by Kari Jobe. Fyi, it's officially a National Flood Day in Jakarta today. 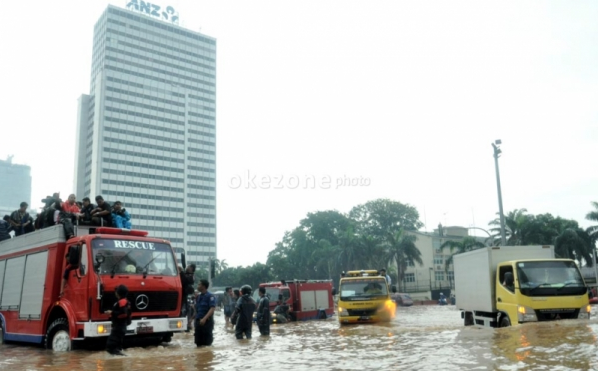 Everywhere in Jakarta is flooded by heavy rainfall plus high tide plus blocked sewages and probably dam insufficiency. I'm serious. It's ALL OVER Jakarta. From the Central Jakarta in CBD area, the South, the North, the West and the East. Yeappp there you go. 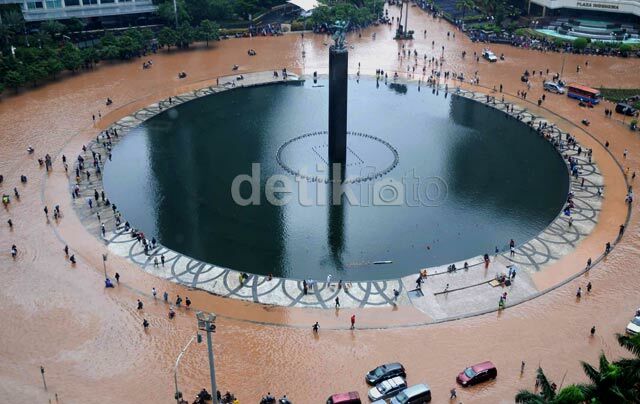 The chocolatey HI roundabout, right at the core of Jakarta CBD area. Surrounding this superstar roundabout is the famed four world-class hotels: Mandarin Oriental, Kempinski, Hyatt, Pullman. My colleagues and company guests mostly reside in this area. Really hope they won't be traumatised by this "special" Jakarta experience. That's exactly infront of Mandarin Oriental, which is right in the heart of Jakarta CBD area. 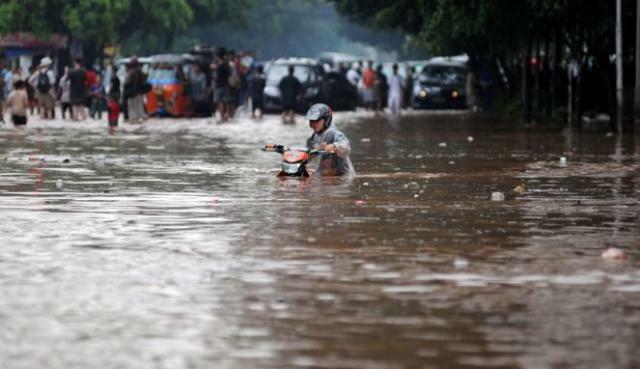 Motorcyclist surrendering to the water level. 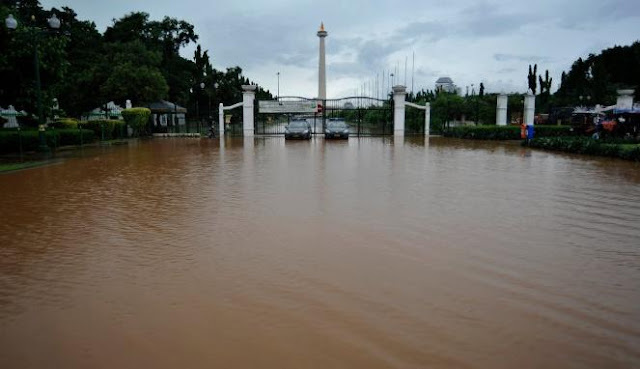 Some area in Jakarta got flood as high as 4 metres. Can't do work cause my laptop's charger is in the office. Internet's also been laggy (ha! Perfect excuse to procrastinate). But luckily electricity's still on, unlike some other unfortunate friends of mine that run out of electricity. Never before, in my entire life, witnessing such natural catastrophic event. 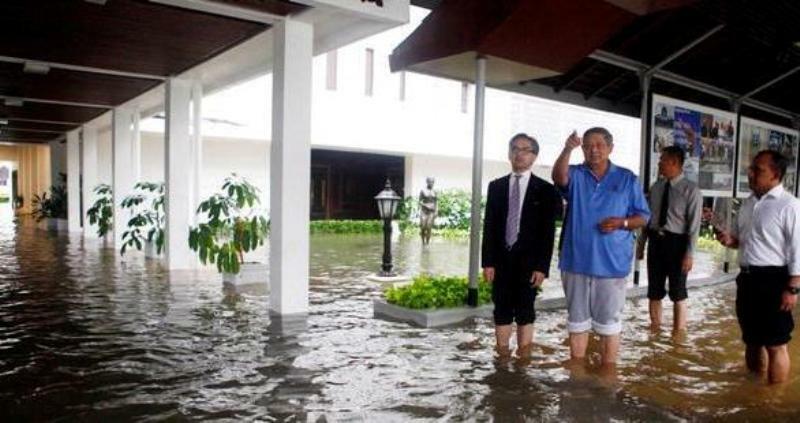 And this is only a flood. What happened to those people in the 2000 Aceh tsunami? 2006 Lapindo mud disaster? Last year's Mount Lokon's volcanic eruption? Doh. Protect Indonesia please dear Lord. It's only by Your grace.. I believe that everything happens for a reason. 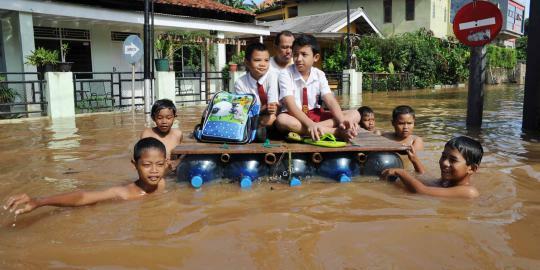 It's really heart warming to see Jakarta civilians come down to the street, hand in hand helping the kids and the elderlies to pass through the flood. In the news, I saw policemen and highschoolies together pushing gerobak and motorcycles. 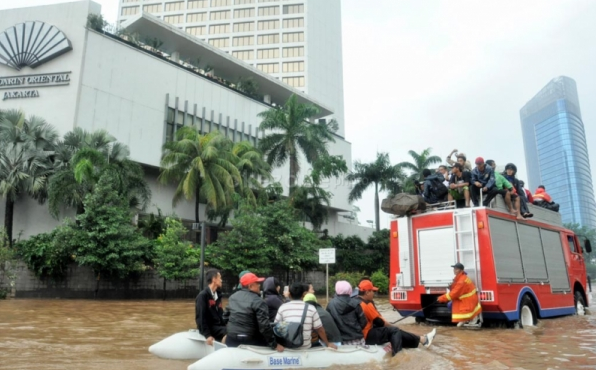 Many government institutions also make ready the evacuation camps across Jakarta. SAR teams are also everywhere to help people evacuate. 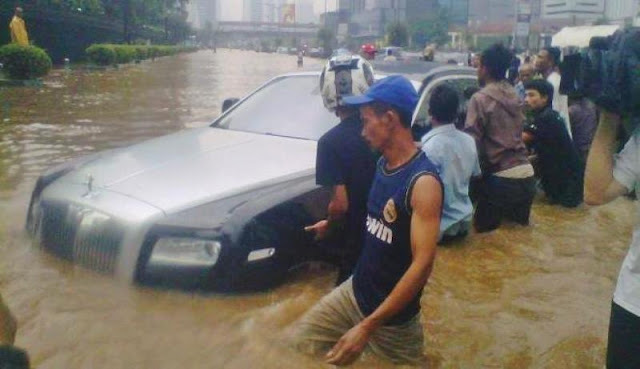 So high.. May God be with you..
People helping the literally drowned car. 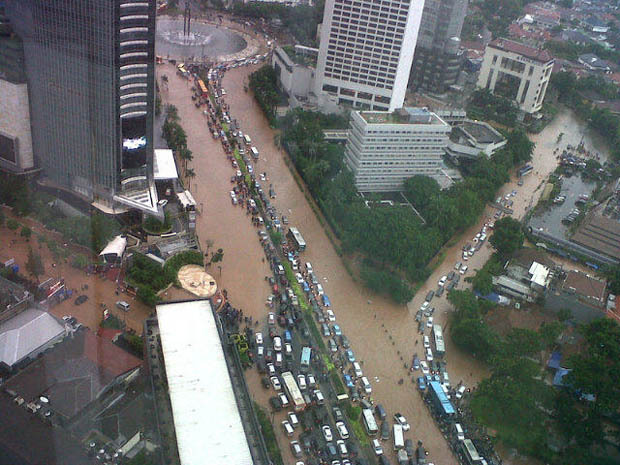 I bet you Jan 2013 is Jakarta insurance companies' worst nightmare. What touched me the most is, when one of my church friend initiated to distribute free lunchbox and drinking water to the flood victims. I keep telling myself "I want to help I want to help", but the problem is, most of us (even my family and me) are victims ourselves, although not as severe as those in the evacuation camps. So when this guy voiced it out, I go "Hallelujah praise the Lord!!" He's such a sweetheart. Then we gathered donations under the name of Project Indonesia to buy the food and the drinks, and he'll distribute it to the refugees early morning tomorrow along with other people. 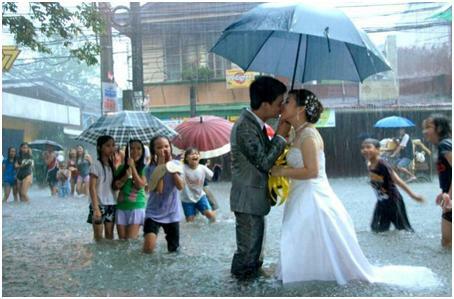 Bottomline is, there's always something we can do to help other people. If we don't have the time, we can donate money. If we don't have the bucks ($_$), we can share what resources that we have. If there's nothing to share? We can always rally the people. If we can't gather the people, we can pray for them. So again, there's no excuse in helping others. And for Jakarta? There's always something we can do to improve this city. Stop complaining, start doing. Everything big starts somewhere.. Let's chant this together: There's always something I can do. So come onnnn Jakarta! We can be better!! A funny sidenote: Heard from my parent that in some places, people found sofas and used mattresses floating on the rivers. Ha! 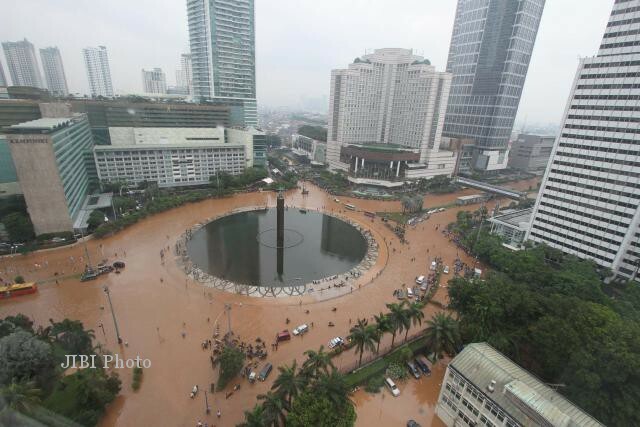 Talk about flood-free Jakarta. 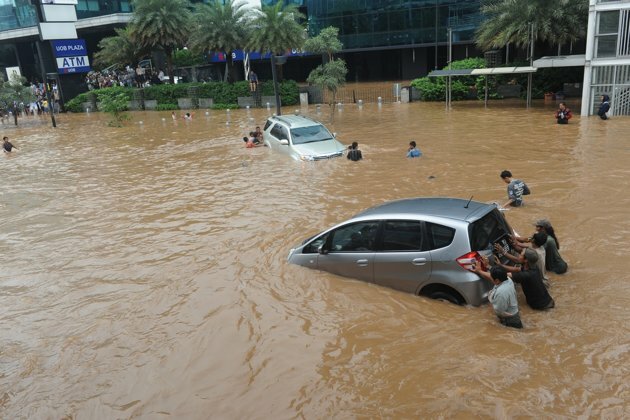 My friend also said in UOB Plaza (in the CBD area), the 3 floors basement parking are totally drenched and all parked cars are underwater now. The water is probably about 10 metre deep. I just went on a diving trip to Thousand Islands couple of weeks ago and they told me to prepare my gears again, just in case I want to experience the special Jakarta CBD dive. Lol. 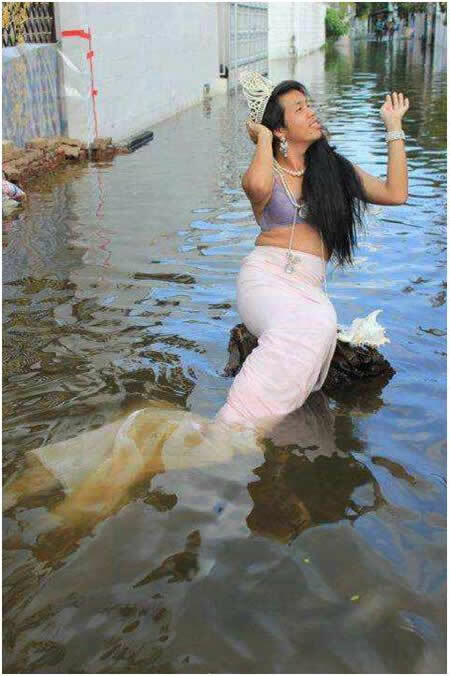 Found a mermaid in the water! Superlolllll! Somebody's certainly having a lot of fun there. Guess what? A Rolls Royce got jammed near Grand Indonesia! I wonder what's it doing there at that time. 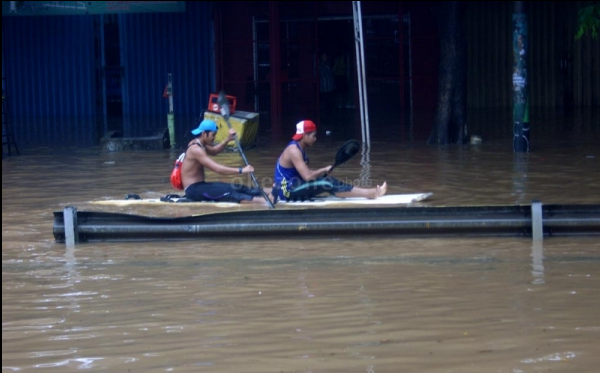 Canoeing in Sunter area lol. That's our Jakarta icon: The National Monument a.k.a Monas. The famous joke of the day lol. 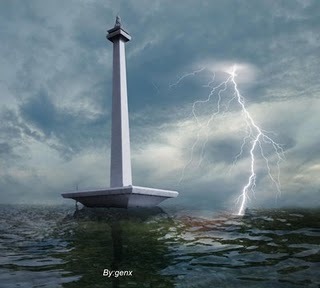 One day, nearing the end of Jakarta, Monas will look like this. One day. If you feel called to help, you can donate to Project Indonesia, a social charity founded by Indonesian youths who are passionate about improving Indonesians welfare :) We've been doing many regular social activities these past 3 years and we're so on fire in our cause! Well we're affiliated with The Cause and you can see the church's website here. We're Christian youths residing in Jakarta, but hey, Jakarta needs help from everyone regardless of religions. Donation is much appreciated! Gbu.